Goh Choon Huat of Singapore leads the 12-man sprint to take second place for the stage and top spot in the overall standings. 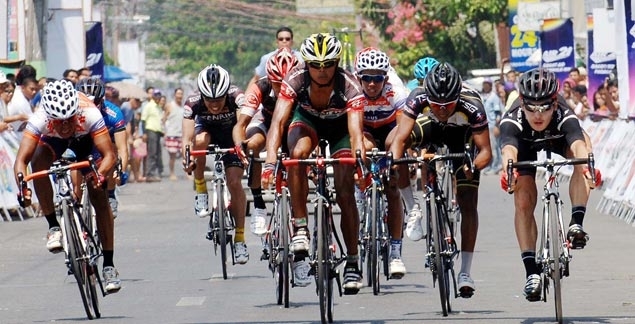 CABANATUAN CITY — The Philippines’ Mark John Lexter Galedo snatched stage honors on Tuesday and jumped from 31st place to third overall, while Goh Choon Huat of OCBC Singapore took the overall lead halfway through the 2014 Le Tour de Filipinas. 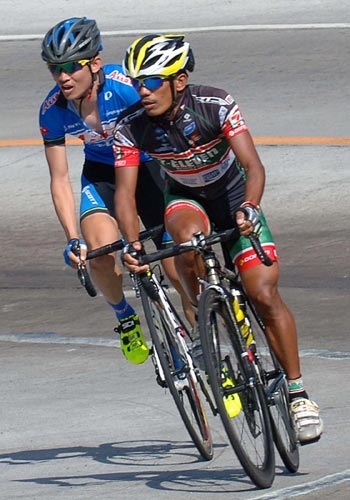 Galedo, 28, bolted out of a 13-man lead group in the final eight kilometres and was never challenged, finishing the 175.5-km stage from Olongapo to this bustling Nueva Ecija capital in four hours, 14 minutes and 34 seconds. Korea’s Park Sung Baek of Continental Team KSPO led the 12-man chase to claim second place, 47 seconds behind the stage winner, while Galedo’s 7-Eleven Road Bike teammate Chris Joven grabbed the final podium place. The cyclists were given exclusive passage over the north-bound lanes of the SCTEX, became the first ones to pass the brand new TPLEX before hitting Nueva Ecija on the way to the finish line. OCBC Singapore’s Australian rider Eric Timothy Sheppard, the Stage One winner, slipped to second place, 3:03 behind in the general individual classification. Kazakhstan’s Nazar Jumabejov of Polygon Sweet Nice jumped from 12th to fourth (3:58 behind) and Indonesia’s Dadi Suryadi of Pegasus from 14th to fifth (3:58 behind). Rounding out the top 10 were Iran’s Hossein Alizadeh of Tabriz Shahrhdari Ranking sixth (from 20th, 4:21 behind), Denmark’s John Ebsen of CCN seventh (from 21st, 4:21 behind), Japan’s Yoshimitsu Hiratsuka of Aisan eighth (from 24th, 4:21 behind), Australia’s Brendon Meney of Satalyst Giant ninth (down from seventh, 4:32 behind) and Indonesia’s Hari Fitrianto of CCN still 10th (5:59 behind). Joven’s third-place performance, however, could only push him from 42nd to 27th overall (10:14 behind). Park was aggressive all day and swept all three intermediate sprints to find himself leading the category with 19 points, seven more than UAE National Team’s Alhammadiy Mirza. OCBC Singapore continued to lead the team general classification with a total time of 25:13:13 over a combined 335.5-km distance over two stages, followed by 7-Eleven Road Bike (6:29 behind) and KSPO Continental Team (6:46 behind). The team time is the sum of the times of the squad’s first three riders to cross the finish line. The race is now down to 65 riders with six cyclists abandoning Tuesday’s Stage Two of the four-stage race presented by Air21. Stage Three of the fifth edition of Le Tour supported by Smart, NLEX, SCTEX, TPLEX, BCDA, Petron, Victory Liner and M. Lhuillier will be the second shortest in the 2014 Le Tour at 146.6 kms from here to Bayombong over Dalton Pass on Wednesday. The race ends Thursday with the dreaded Stage Four — a roller-coaster leg from the Nueva Viscaya capital to Baguio City via Kayapa Road and Ambuklao in Benguet.